I came across this book when I was studying to become a counselor in seminary. It was a required textbook for a class on marriage and family counseling. At that time, I didn’t have strong convictions about how counseling ought to be done or what the outcome of counseling ought to be. I was trying to figure those things out. This sticky-statement from Gary Thomas was very formative in that process. It is when I began to realize that counseling was not just about symptom relief, but also character formation. Counseling doesn’t just help emotions and relationships become less conflicted (i.e., more or less happy), it also inevitably has a role in shaping individuals into certain kinds of people (i.e., more or less holy). For clarity, happiness and holiness are neither mutually exclusive nor in competition with one another; at least not if we are talking about long-term, sustainable happiness without the aftertaste of regret. 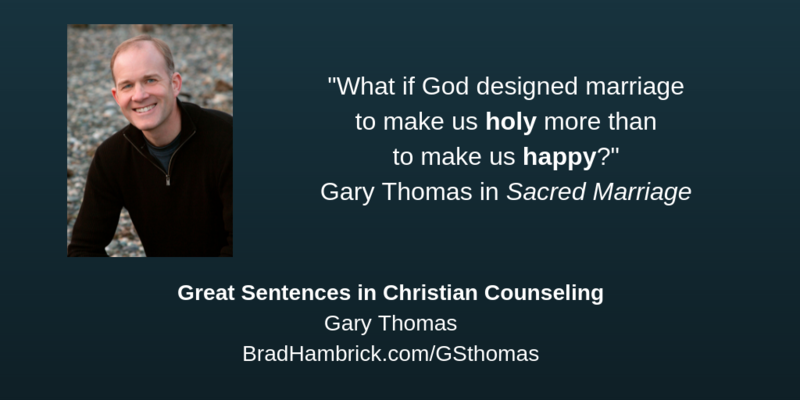 So Gary Thomas is not saying that we must choose between a happy marriage and a holy life. 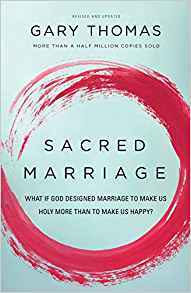 What made this quote more impactful for me was that not only was I a counselor-in-training when I first read Sacred Marriage, I was also a newlywed. These challenges of which we are talking were not theoretical conversations I would someday have with a counselee; they were here-and-now conversations I was having with myself. I was learning what it meant to value holiness as a way to happiness in the day-to-day choices of marriage. The greatest challenges I’ve faced in having this quote shape my counseling come in two varieties: those who resist the concept and those who mis-apply this concept in a dangerous situation. First, there is the challenge of those who stridently insist that marriage exists to make them happy even when their demands (verbal or emotional) are undermining viability of the marriage. In this sense, these individuals might be “maritally anorexic;” that is, they are destroying the body/relationship which they believe they are “perfecting” (in a distorted sense). It can be as difficult to convince someone who is “maritally anorexic” that their pattern of relating is destructive as it is to convince someone who has a destructive relationship with food. They only see the good they want, not the bad they are doing in the pursuit of that good. Second, there is the challenge of those who believe that God is more concerned with their character than their safety; individuals in abusive relationships who believe God is so concerned about preserving marriage that he tacitly endorses abuse. This latter challenge is a larger subject than this blog post can address, but if you are interested in this subject, I would recommend my blog series Marriage with a Chronically Self-Centered Spouse.